Donald Trump Jr., the president’s eldest son and chief defender, reportedly doesn’t think he did anything wrong by meeting with a Russian lawyer offering dirt on Hillary Clinton. “Does he regret it because he thinks he did something wrong? No. He regrets it because it ended up causing a situation that wasted a lot of time and money,” a source close to Trump Jr. told GQ. The president’s eldest son also reportedly joked about his involvement in the investigations into Russian collusion while appearing before the Senate. 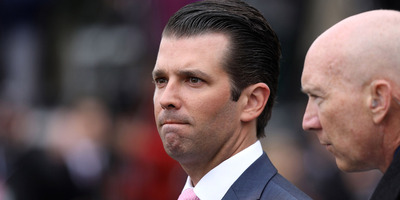 Donald Trump Jr., the president’s eldest son and chief defender, reportedly doesn’t think he did anything wrong by meeting with a Russian lawyer offering dirt on former Democratic presidential nominee Hillary Clinton during the presidential election. Another source who attended the infamous June 2016 Trump Tower meeting told Ioffe that Trump Jr. was deeply disappointed after he discovered the lawyer, Natalia Veselnitskaya, a Kremlin operative, did not have the damaging information she had promised about his father’s political opponent. This meeting, first reported on last summer, and another meeting Trump Jr. held with an emissary for the crown princes of Saudi Arabia and the United Arab Emirates, who offered to help candidate Donald Trump win the White House, have become major pieces of the ongoing special counsel investigation into possible collusion between the Trump campaign and the Russian government. But Trump Jr. does not seem to grasp the extent of the potential damage he’s inflicted on his father or the implications of the congressional and special counsel investigations, according to sources who spoke with Ioffe. Trump Jr. reportedly joked about his role in the collusion investigation during his visit to the Senate to testify before the Judiciary Committee last fall. And Trump Jr. “wasn’t embarrassed” to reveal to the Senate committee the messages he exchanged with WikiLeaks, the source said, even though the organisation is widely understood to have close ties to the Russian government. “He’s too stupid to be malicious,” the person said.